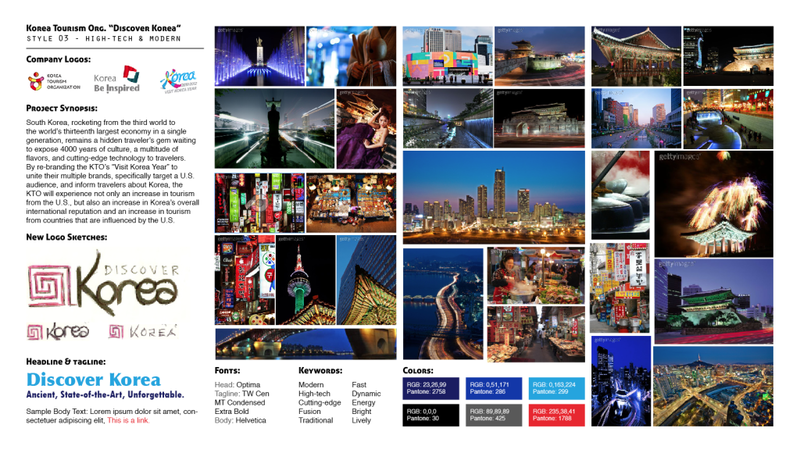 In order to get a feel for the project from the get-go, I was asked to create a number of different moodboards, including a SWOT (Strengths, Weaknesses, Opportunities, Threats) moodboard, to take my design ideas and inspiration from general to specific and targeted. Ultimately, this process was absolutely key to figuring out the design direction I wanted to go. 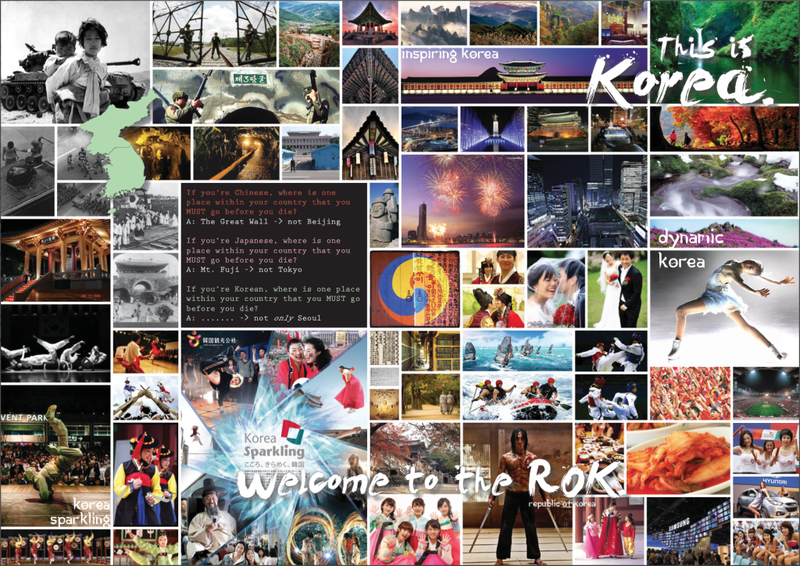 Those three initial questions were essential to get me thinking about Korean tourism from a different perspective. 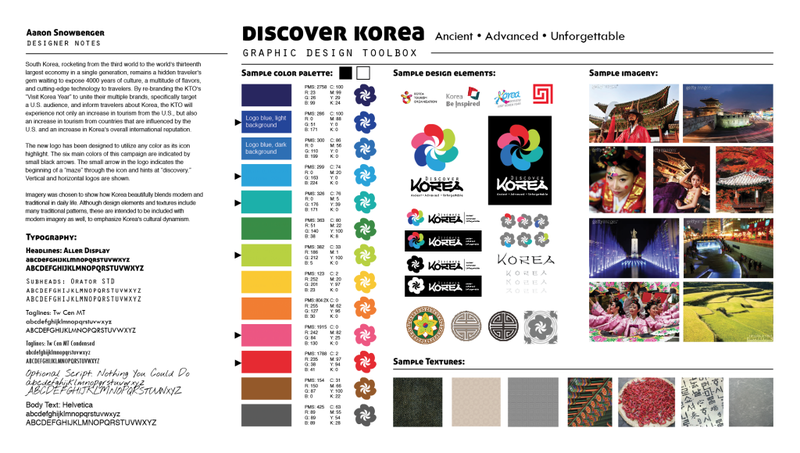 Seoul is so often the focus of tourism campaigns and I wanted to think “outside the box” for this project. The problem is that Korean tourism focuses on Seoul so much, it often does seem to become the major focal point of a tourism campaign. But many travelers are less interested in big city life than they are in cultural and traditional assets. Tourism shouldn’t be about cities, but about culture and history. 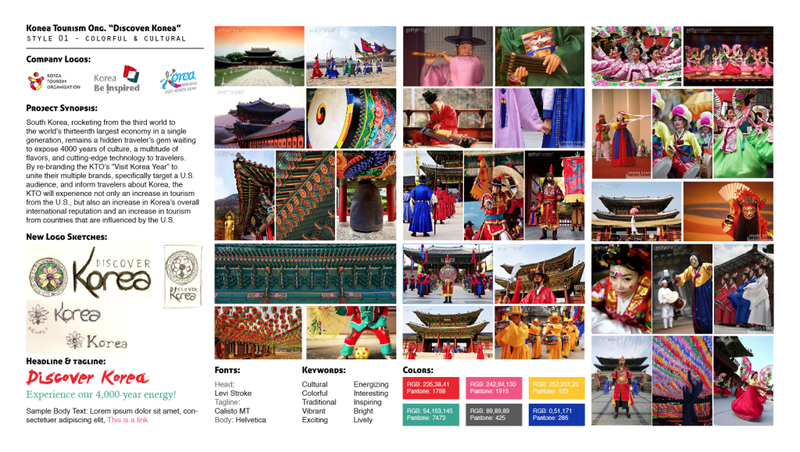 In this SWOT board, I was drawn to vivid colors, strong imagery, very Korean textures, patterns, and lettering, and showing a contrast between modern/technological and traditional/cultural. Weak, boring images, pastel colors, and anything related to or reminiscent of North Korea was to be avoided. Korea needs to establish itself as unique from its neighbors, distinct, and with no immediate connection to North Korea. 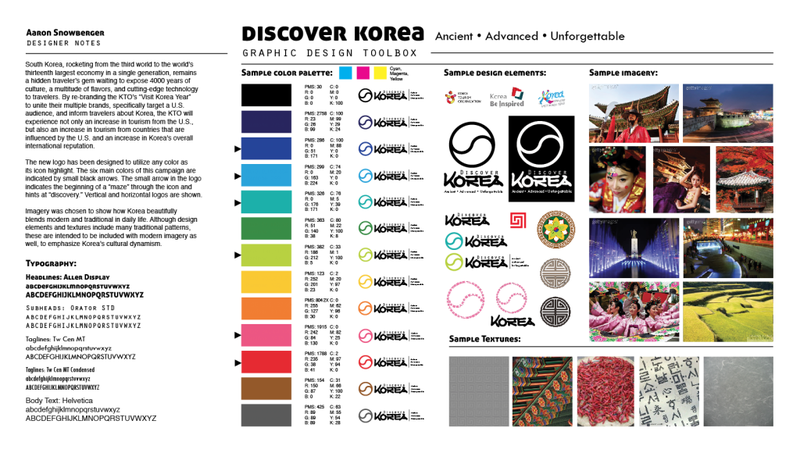 This will help draw in tourists to discover the Korea they don’t know. 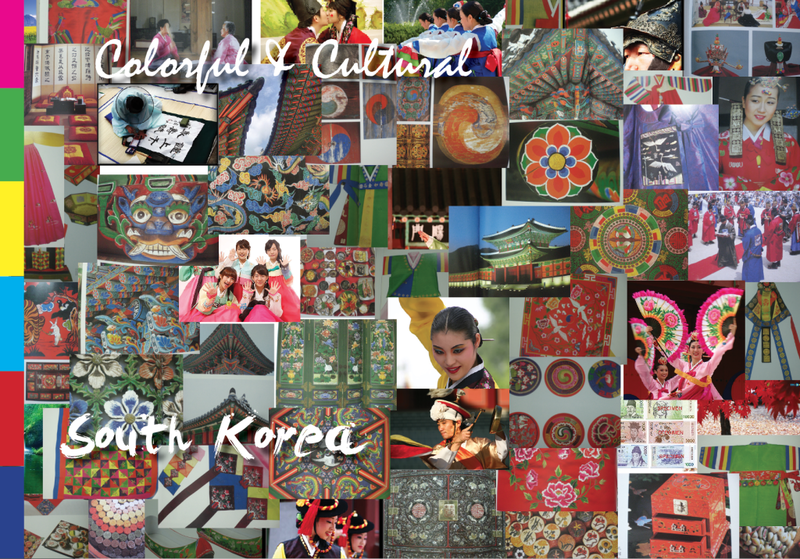 Moodboard ONE: Shows Traditional and Ancient Korea. 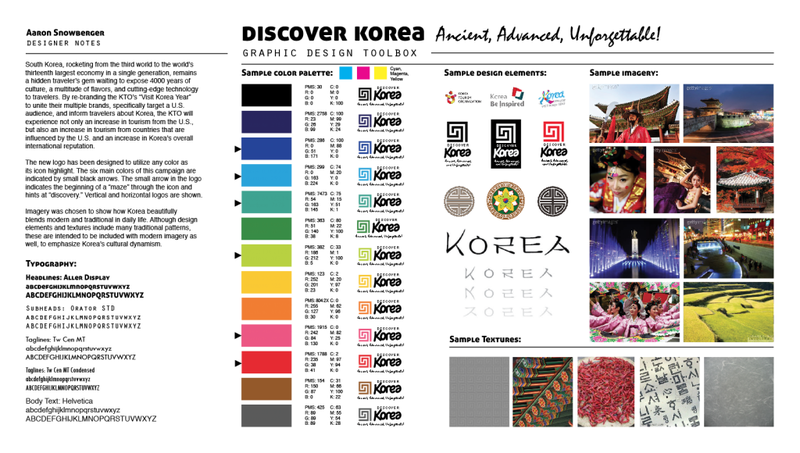 There are many images of Korea’s historic architecture, traditional clothes, and the brilliant rainbow of colors that permeates all of Korean life. 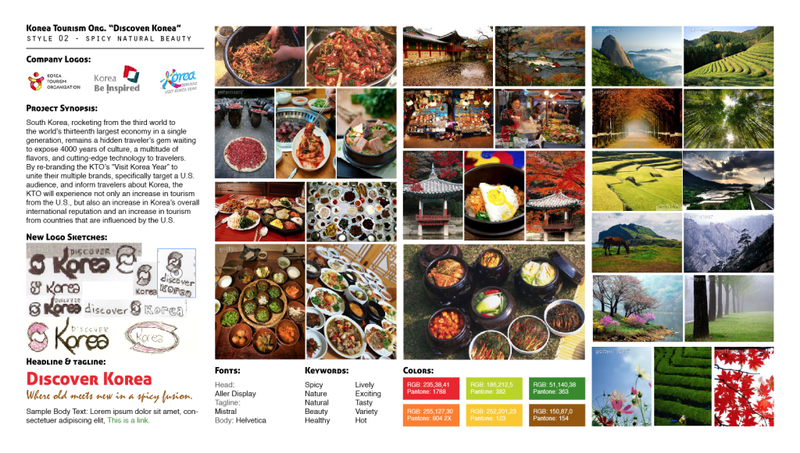 Moodboard TWO: Shows the Food and Nature of Korea. 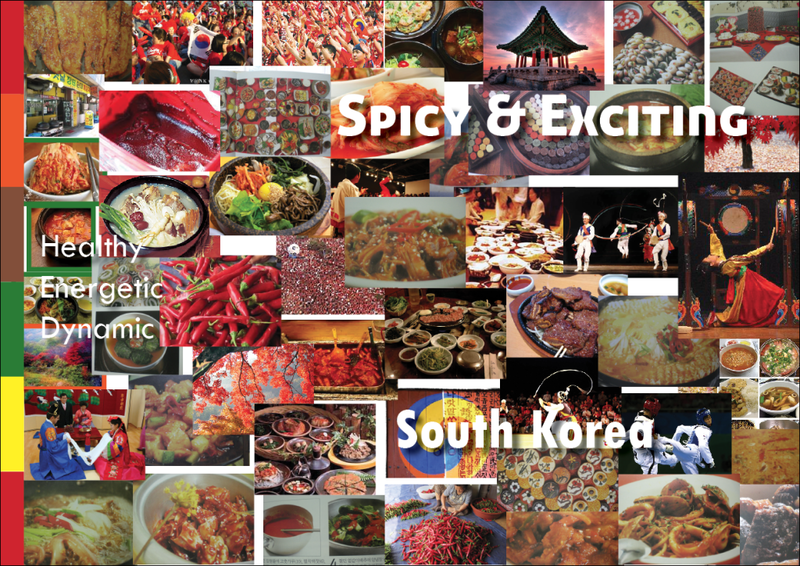 Korea is renowned all over the world for its wonderful, nutritious, and spicy food, including the dozens of side dishes present at every meal. Additionally, because Korea is 70% mountainous, it contains some of the most beautiful scenery that can be photographed. 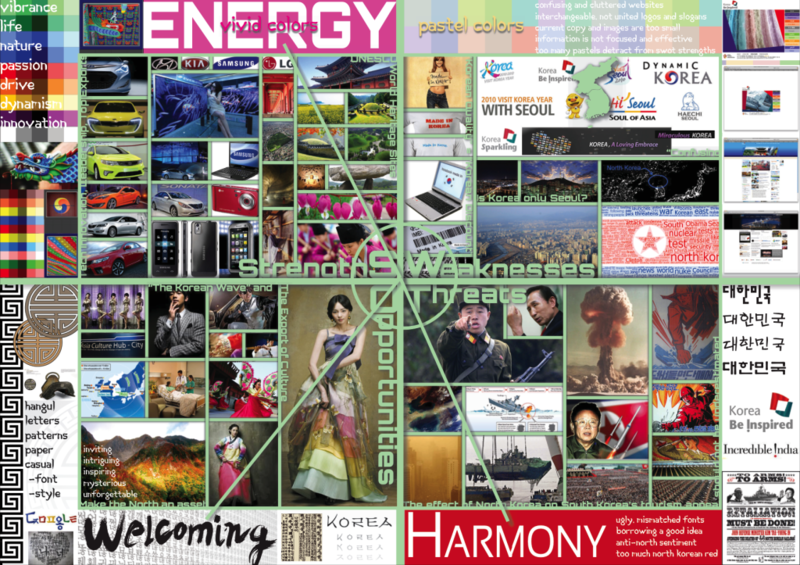 Moodboard THREE: Shows the High-tech and Modern nature of Korea. 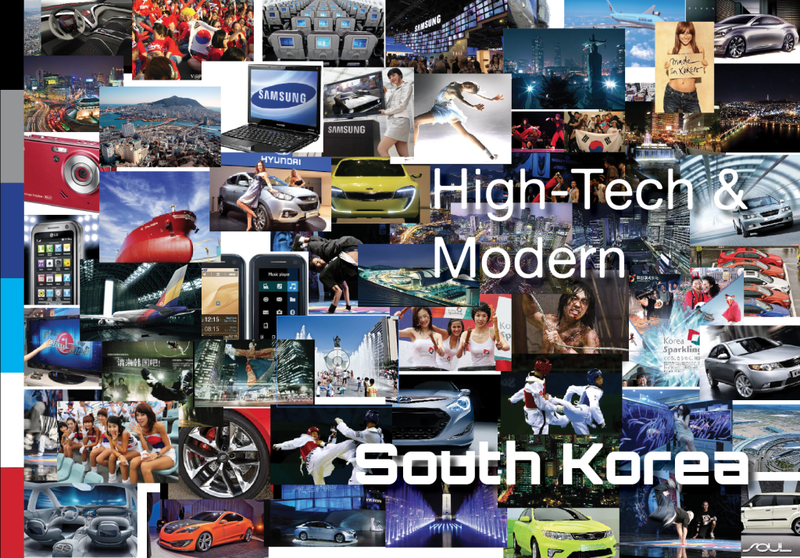 Korean companies LG, Samsung, and Hyundai have become global leaders in tech development and innovation. This is something that Korea needs to take advantage of in tourism marketing, particularly because over 50% of Americans (at this time) don’t even realize that these are Korean companies.